Animated GIFs are so popular these days and most of the time we can see some new Animated Gifs on many social networking sites. Few days later back I mention about some free websites which allows to create free animated GIFs online. Their are lots more other tools are available on the net which allows you to do the same, but today i found a new Google Chrome addon called MakeGIF Video Capture. 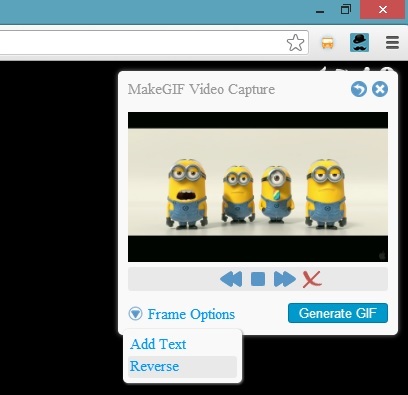 MakeGIF Video Capture is a free Google Chrome addon which allow you to capture any HTML5 video from popular sites like YouTube or Vimeo and convert them into GIF animations instantly. One of the fastest and easiest way to to create Animated Gifs from video. 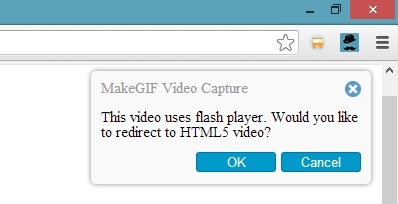 To use this addon all you hvae to install the MakeGIF Video Capture addon on your Google chrome browser. You can download the addon from the Google Chrome web store or you can find the download link at the end of this post. So lets take a look how the addon works and how you can create the Animated Gifs with this free addon. Now the video will open in the full screen mode and you ready to create the animation. 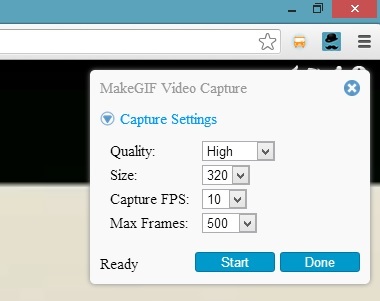 Now from the MakeGif configure the Capture setting for your Animated GIFs. From here you can change the recording settings and frame rate. Once the settings are configured hit the Start button to create the animation and Done to Stop the recording. Now on the same window you can see the preview of your animation that you created with this addon. From here you can also add text, or even reverse the frame. After this hit the “Generated GIF” button and it will proceed to generate the animated GIF. This will take some time upon the size of the animation that you want to create. Now your Animated GIF is created and you can share the same with your friend and download it on your desktop. Below you can see the sample of the Animated GIF that we created with this Google Chrome addon. You have to must try this free addon on your Google chrome browser if you want to create Animation from the Online video sites. One of the most easiest way to create animated gif with video. If you are looking for more How to tips and guides, click here!